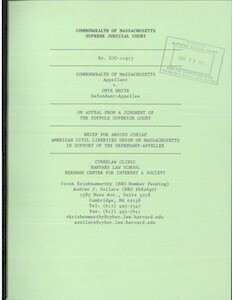 The Cyberlaw Clinic filed an amicus brief (PDF) in the Supreme Judicial Court of Massachusetts on behalf of the American Civil Liberties Union of Massachusetts (ACLUM) in Commonwealth v. White, SJC-11917. This is the third case in as many years in which Massachusetts’s highest court has sought the input of amici to help clarify when law enforcement may glean information from a cell phone to advance a criminal investigation. At issue in White is the question of what evidence is required to establish probable cause to seize a cell phone without a warrant – especially in view of an allegation that the cell phone contains a remote wipe feature, raising the specter of its contents being erased if the police don’t immediately seize it. The case also considers the length of time after which the warrantless seizure of a phone becomes constitutionally unreasonable due to the police’s continuing failure to obtain a warrant. ACLUM argues that the ubiquity of cell phones, their powerful functionality, and their capacity to store enormous amounts of private information are reasons that they merit the very strongest privacy protections as enshrined in the Bill of Rights and the Massachusetts Declaration of Rights. Applying these protections, the brief argues first that the enormous capability of cell phones to store materials of evidentiary value does not automatically establish probable cause to search a criminal suspect’s cell phone, anymore than the enormity of what can be stored in a criminal suspect’s house automatically gives rise to probable cause in that situation. Rather, law enforcement must show some specific and objective indication that the suspect ever stored incriminating evidence on it or used it in relation to the crime to establish probable cause. Second, the brief argues that the “remote wipe” capabilities built into all modern cell phones does not automatically establish an exigent circumstance allowing law enforcement to seize cell phones without a warrant. Absent some some specific, non-speculative evidence that the feature will actually and imminently be deployed, warrantless seizures of cell phones are every bit as unreasonable as every other kind of warrantless seizure. Third, the brief argues that it is constitutionally unreasonable for law enforcement to hold on to a suspect’s cell phone for nearly ten weeks before applying for a warrant to search it, in view of the strong privacy interest that individuals have in their cell phones given the vast amounts of information that can be stored on one. The White appeal follows closely on recent SJC and Supreme Court decisions reaffirming individuals’ privacy interests in their cell phones. These cases include the SJC’s recent decisions in Commonwealth v. Estabrook (where the Cyberlaw Clinic filed an amicus brief on behalf of ACLUM and the EFF), and Commonwealth v. Augustine (where ACLUM represented the defendant and the Clinic filed an amicus brief on behalf of the EFF). The case is scheduled for argument on Tuesday, December 8th at the John Adams Courthouse in Boston. Special thanks go to HLS Cyberlaw Clinic students Kenneth Monroe (HLS JD ’16) and Brian Pilchik (HLS JD ’17), who worked closely with Vivek Krishnamurthy, Andy Sellars, and the amici to prepare and file the brief. This entry was posted in Amicus, Fourth Amendment, Privacy. Bookmark the permalink.